Today was so sunny that I had to put on my new sparkly jeans by Named, Jamie Jeans. This is my second take on the pattern. The first pair was made from cheap denim and looked like it. This fabric, 120cm-wide stretch denim with lurex, came from McCulloch & Wallis. According to the Named fabric requirements chart, I should have needed 175cm but I used only 140cm. A gold lurex thread woven into the fabric gives it a healthy amount of sparkle which I like. 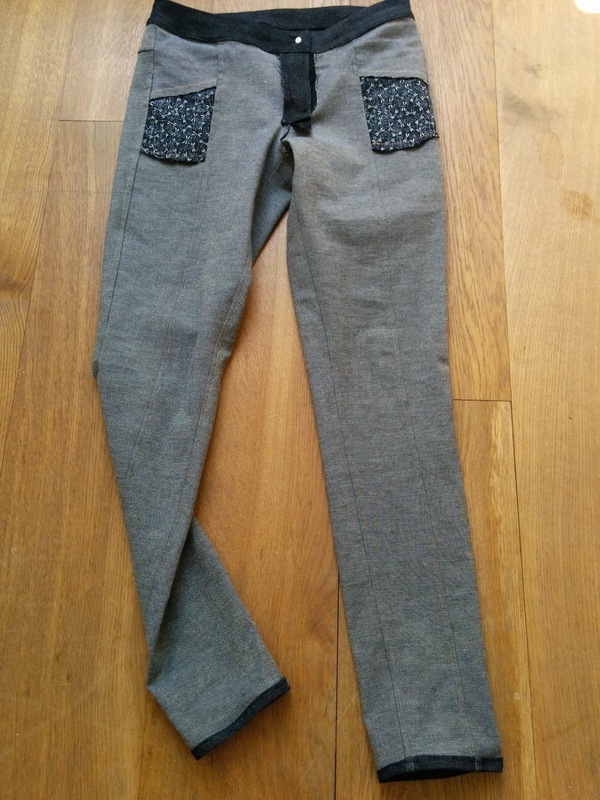 I sewed the Jamie Jean in a size 40 without any major alterations: I only tweaked the crotch seam a little bit, adjusting it to the size of my bum. I did not add belt loops because the waistband ran around my waist perfectly, without gaping. It may expand after a few wears, but for the moment I'll wait and see. I could not be happier with the fit. Although I still may improve the crotch. On the photos the Jamie Jeans look wrinkly, but they do fit me rather well. On the other hand, it was impossible to re-create a natural pose for the photos without showing some wrinkles. I wonder how models do it (•ิ_•ิ)? 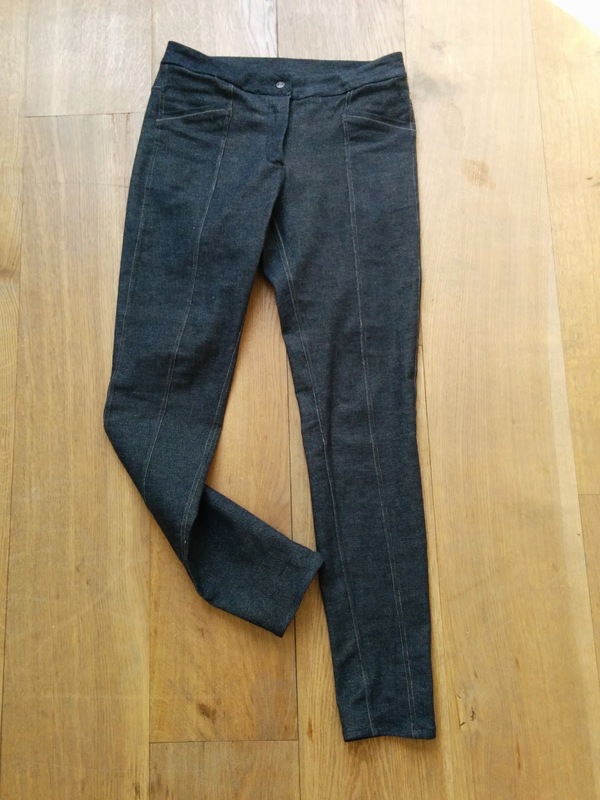 For this pair of jeans, I used flat felled seams to give them a special finish. When I studied at ESMOD Tokyo, we used this seam for shirts and blouses but, if you examine your jeans, you will notice that they are treated with exactly the same seam. Some people even call this seam "the jeans seam". 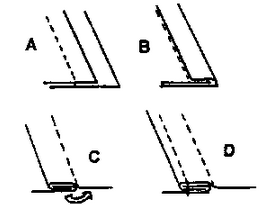 The idea of the flat felled seam is somehow similar to the French seam but they differ in the execution. While the French seam will enclose both raw edges inside the stitching, with the flat felled seam you place one raw edge X inside the folded edge of fabric Y, then wrap the edge Y one more time and topstitch. If this is confusing, the diagram below may be more helpful. If not, I will blog a short tutorial on how to sew a flat felled seam next week. The flat felled seam is super strong and that is why it's used for sewing jeans, shirts and children's clothes. If you watched The Great British Sewing Bee, the competitors had to use this seam when sewing a pair of children's dungarees. Here's another advantage of this seam. When I turn my jeans inside out, they look as neat as they do normally. Isn't it amazing? I have to confess, the flat felled seam requires a lot of patience, precision and concentration. You have to pay very close attention to which seam goes where, otherwise you'll end up like me, unpicking two entire seams instead of one! But, seriously, the results are worth it! After sewing the Alpi Chinos and the Jamie Jeans, I prefer the latter. As much as I like the relaxed style of the chinos, the Jamie Jeans give a more "dressed" look with interesting lines. Great fit Inna. Love the seams! They were made for you! They look amazing and I can only guess the lurex is better IRL, love this pattern. WOW! They are great. I really live the style, and I can't believe how well they fit. I would not even attempt a pair of jeans. Amazing! The fit on these look fantastic! And wow, the flat-felled seams really tidy up the insides. I've been faux flat-felling my pants seams, and it's just not the same! Perfect jeans, the inside is just as lovely as the outside. Pretty sure the model photos have been 'manipulated' some how. Now that I sew, I've yet to see a pair of jeans without any kind of whiskering at the front, except for those horrid 'jegging' things. Tights are not pants, people. But these jeans are amazing!! I've admired this pattern from afar since it came out, and it was already onmy want-to-sew list - now they're a definite after seeing yours. They look great - really loving the denim you've sewn them from. They suit you really well! hehe ;) Thank you! If you worry about the fit, why won't you make a muslin first? Oh yeah! You do notice sparkles better :) This pattern is really very well drafted! I could no recommend it more to somebody who's craving for a nice pair of jeans. Oh non :) Depeche toi! Do not underestimate your skills! I think you should give a pair of jeans a try. When you check Named website, the Jamie Jean on their models also wrinkle which makes me feel better and more confident. P.S. I am so looking forward to seeing your wedding dress! Perfect fit and I love the denim! Wow, these look fantastic. The spring weather in your photos looks lovely too! I have this pattern at home but haven't yet tried it, but I think you've inspired me to give it a go. Beautiful execution! Love the bit about flat felled seams. I always love a good sewing/patternmaking tut. As for the model bit, it's not the models - it's Photoshop! Any wrinkles can be erased using Photoshop! Wow - great jeans! I want to make those too! Inna, these look fantastic on you! More sparkles! Dziękuję bardzo! Between you and me, shoes are my obsession.. I love your pair of sparkly jamie jeans and so beautiful on the inside! I'm gonna have to try the flat felled seam - for my other jeans I've overlocked and topstitched, which is okay but yours are so much prettier. Escaping with my cocoon coat!